Our parties aim to be world-class dance events featuring the latest in music, sound, lighting, visuals and high level production standards. 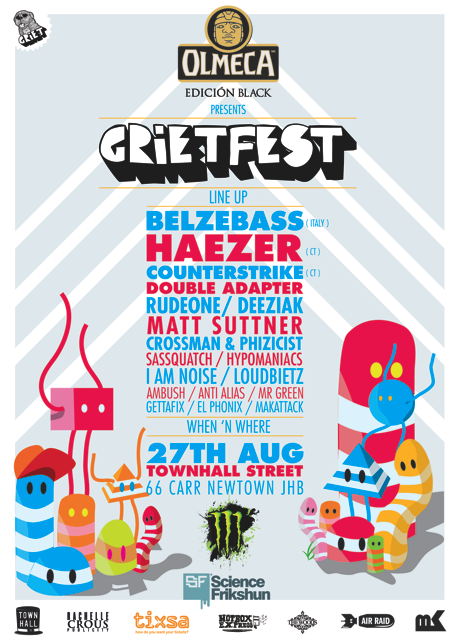 So it comes as no surprise that in August 2011 GRIET now brings you the first ever electro festival in South Africa: GRIETFEST! Olmeca Edicion Black is proudly sponsoring GRIETFEST, fueled by Monster Energy. Hotbox Express is also supporting GRIETFEST by supplying a party bus from Pretoria to Johannesburg on the night. Big sound! Massive lighting! 3 stages, fast bars, food stalls and good vibrations! Be sure to catch GRIETFEST live on MK’s Studio 1 on the 25th of August at 19h30, as well as Belzebass live on Live@5 on 5FM on the 27th of August at 18h00. Be sure to head over to http://www.olmeca.co.za for more info and some awesome prizes to be won! New Artist: SFR plus free EP & Free the Trash!! !